The CD Proceedings of the Four Regional Seminars on "Market Transformation: Capitalizing on Energy Efficient Technologies"
This CD-ROM proceedings contains papers presented at the Four Regional Seminars on "Market Transformation: Capitalizing on Energy Efficient Technologies", held between July and August 2001 in Europe, Asia, Africa and Latin America. 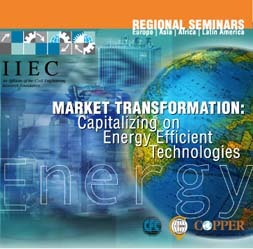 The objective of the seminars was to disseminate lessons learned in the three-year India and China energy efficiency market transformation program and to enable industries, uitilities, manufacturers, governments and financiers in each region to meet and discuss business opportunities stemming from the use of energy efficient technologies. Summaries of all presentations and comments made by the speakers and participants were compiled and made available on the CD-ROM. The electronic copies of papers and presentation slides presented during the seminars are also included. These proceedings will serve as a useful reference for the participants and for other energy professionals who are interested in market transformation of energy efficient products.